It is a rare thing for a chapter to achieve the level of charitable giving that entitles them to receive a certificate of recognition; it is a rarer thing for them to receive the top award – a Grand Patron Certificate. On an otherwise normal evening for Old Masonians West Lancashire Chapter No 7702, the chapter was opened with due ceremony by the three principals Eric Miller, Mike Williams and late stand-in Darren Brown. 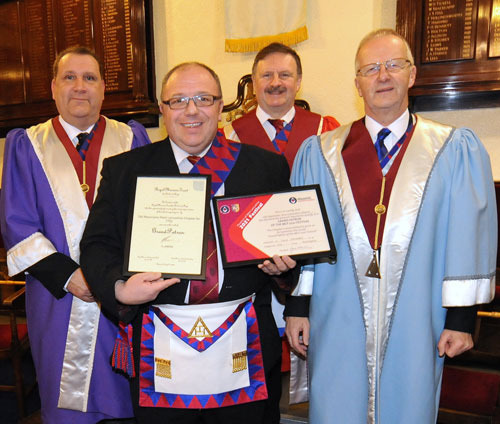 After balloting for one of their older companions to be made an honorary member, an excellent paper was presented to the convocation by some of its members, entitled ‘The Ceremony of Exaltation and the Concept of Light’, which provided all present with their daily advancement of Masonic knowledge. To add even more, visiting companion Graham Greenall delivered a truly splendid paper on ‘Poetry and Freemasonry’. Often the chapter room is entertained with eloquence in the course of its ritual, but rarely is heard the lilt and rhyme of poetry; Graham delivered an entertaining insight, and interspersed this with superb renditions, bringing resounding applause after the delivery. So far, the normal evening had been exceptional in content, but it was about to become extraordinary when Graham performed his second pleasant task of the evening, presenting the three principals (representing the companions of the chapter) with two Grand Patron Certificates: from The Masonic Trust for Girls and Boys and from the MCF 2021 Festival. The convocation was closed with due ceremony and all settled to a hearty festive board. Graham spoke to the assembled there, complementing the chapter with the highest praise on such a rare achievement. The two certificates were displayed in pride of place at the top table. It is planned to display these two badges of charitable honour at the secretary’s table during future convocations; a fitting celebration of an illustrious ‘double top’. Story by Eric Miller, photograph by Peter Gore.